Polypropylene copolymer is a type of thermoplastic addition polymer which is produced by consolidation of numerous units of propylene monomers. It is transparent and colourless with a glossy and relatively slippery surface. Polypropylene copolymer is resistant to corrosion and electricity, and resilient against many forms physical damage. It is a versatile material which can be processed by various methods such as injection moulding, extrusion, blown, blow moulding, cast film and thermoforming. Furthermore, it does not have negative impact on environment as this polymer is 100% recyclable, has high calorific value and does not emit any toxic chemicals. Owing to these properties, it is used in the packaging industry; fibre applications which include ropes, carpets, clothing, etc. ; and in the manufacture of piping systems, biaxially oriented polypropylene (BOPP), automotive components, polymer banknotes, etc. Moreover, polypropylene copolymer is suitable for manufacturing living hinges as it does not break when bent repeatedly. The production of polypropylene copolymer witnessed a significant growth during 2014-2018 in the major producing countries. In recent years, the level of performance of polypropylene copolymer has increased as various ideas and apparatus have been integrated into the process for the manufacturing of this polymer. 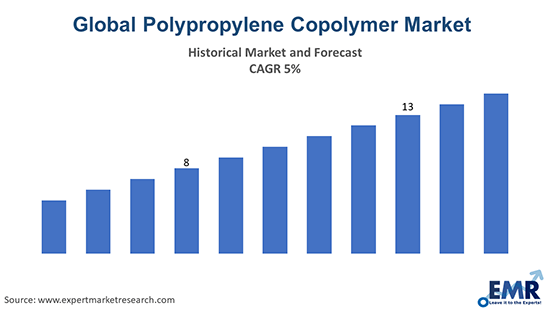 According to a new report by Expert Market Research, the global polypropylene copolymer market reached a volume of 24 Million Tons in 2018 and is further expected to reach 30 Million Tons by 2024. Owing to the rising demand for light weight products, the demand for polypropylene copolymer is increasing from the construction and automobile industries. Growing trend of substituting metal with polypropylene copolymer, rising environmental concerns, changing lifestyles, growing consumer preference and increasing disposable incomes are some of the other factors driving the growth of the market. The major end-uses of polypropylene copolymer include rigid packaging, textiles, technical parts, films and consumer products. In 2018, rigid packaging represented the largest end-use segment with the majority of the market share. Region-wise, Europe dominated the market with a share of one-fourth of the total global production in 2018. Being fragmented in nature, the global polypropylene copolymer market is surrounded by a number of players. Some of these players include Lyondell Basell, Sinopec Group, SABIC, Braskem Group, PetroChina Group and Reliance Industries.